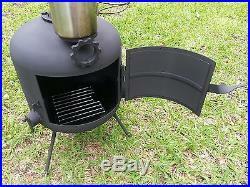 The ultimate military can wood stove, with BBQ grill feature. These stoves are made out of, military spec 50 caliber cans. Has adjustable air vent, and hand forged latch and hardware. Comes with cast iron cooking grates that help absorb and store heat to make it even more efficient, especially with use of the grilling feature. The chimney connection will accept any flared 2-1/2 exhaust pipe. This makes it very easy, and cheap to customize your chimney for your needs. Most any, local auto part stores in your area should have everything you need, straight pipe, 45, and 90 degree elbows and some places even have flex pipe. I included a piece of 8 inch straight pipe to get you started. Each stove goes through a testing process, then sandblasted and painted with a high temperature 1200 degree grill paint, that is safe for cooking and human interaction while using. The legs can be removed, and installed with out need for any tools. I use my personal stove every time we lose power in storms and on kayaking adventures works great for fish. You can fit 2 big burgers on the grill top no problem, and depending on wood you cook with, well lets just say its better than gas or charcoal. Cooking with wood really pumps up the flavor when grilling. This is a great gift to anyone with a outdoor spirt and a great piece for all the preppers and survivalist out there. The Stanley 40oz cooking pot in the images, is not included, it’s to show the cooking and water purification options. For long term use to help the life of the stove add dirt or sand to bottom of the inside of the stove. This helps insulate the bottom of the stove and protects the bottom. Life of these stoves really depends on the user. This is for small cooking task and heating this takes sticks, not big logs and is not a forge. CAUTION carbon dioxide can put you to sleep and you won’t wake up and fire is always dangerous as well especially in a tent. This was designed around a canvas tent and for on the trail task and as a stealthy base camp stove with no bright flame exposure. 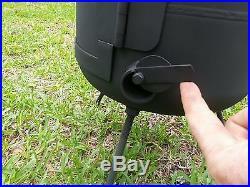 If your not sure YouTube has tons of hot tent set ups and how to videos. Thank you for time and if you have any questions, please ask, I’m here to help. 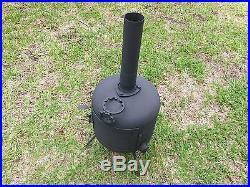 This listing and price is for 1 stove per order Specs & Features: Weight, on average 11 pounds Measurements (just as pictured with legs and included 8 inch chimney) 22-1/4″x 13″x 6-1/2″ Cast Iron Grill top Measures 10-1/4″ x 5-1/2 Large Adjustable Air Flow Vent Removable legs Painted with flat black 1200 degree grill paint Made out of Military spec. 22 gauge 50 cal. 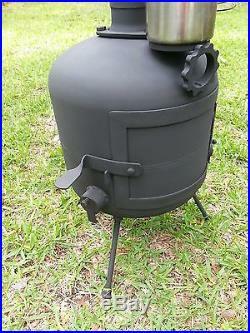 Ammo cans Gives you heat, cooking, grilling and water purification at the time of need with just sticks. The item “Unique Ammo Can Hot Tent Wood Stove With BBQ Grill Emergency Heating Cooking SHTF” is in sale since Tuesday, November 14, 2017. This item is in the category “Sporting Goods\Outdoor Sports\Camping & Hiking\Camping Cooking Supplies\Camping Stoves, Ovens & BBQs\Camping Stoves”. The seller is “stone2steel” and is located in Wilmington, North Carolina. This item can be shipped to United States. 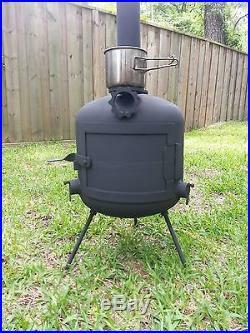 This stove can be used for many applications, sheds, rooms and tents. The chimney is 2-1/2 stainless steel exhaust pipe. Any of your local auto parts store would have all your chimney configuration needs like 90, 45 degree pipe as well as flex pipe. On my tent I stitched a 2 foot by 2 foot square of welders blanket for the chimney thimble. This stove has been sandblasted and painted with a 1200 degree grill paint that is safe to burn as well as eat off of. The air flow venting system is adjustable with spring tension paddles for smooth side to side action. The cook pot in the image is not included, it’s to show off the cook top option. 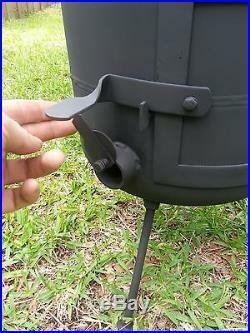 The stove is very stable and works well on unstable grounds with the 3 leg tripod design. Stove stands 31 inches from ground to top of chimney. 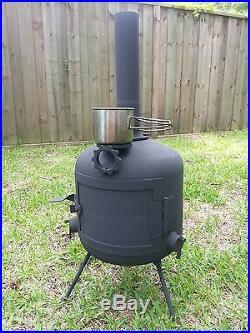 This stove was made from 20lb propane tank. Thank you for your time and view. I’m here to help. 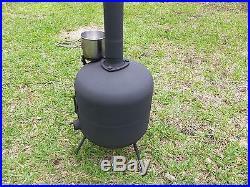 The item “Unique Handmade Propane Tank Hot Tent Wood Stove Off Grid Living & Survival Gear” is in sale since Saturday, July 01, 2017. This item is in the category “Sporting Goods\Outdoor Sports\Camping & Hiking\Camping Cooking Supplies\Camping Stoves, Ovens & BBQs\Camping Stoves”. The seller is “stone2steel” and is located in Wilmington, North Carolina. This item can be shipped to United States.